Apple shows off its new OS - but what's the difference? Apple's unveiling of iOS 8 at WWDC 2014 shows the direction its mobile operating system is heading, but how does iOS 8 stack up versus iOS 7? We've pitted the two against each other to see what's changed in the new OS. Check out our complete run-down of iOS 8 new features. The headline change of iOS 7 was Jony Ive's much maligned redesign, so don't be surprised that there's no lick of paint here. In fact, it's OS X 10 Yosemite that's been given the lick of paint to come in line with iOS, with translucent sidebars and windows. It's not all one-way traffic however. The new sidebars in OS X are here in iOS 8, which means extra information is available when browsing contacts and maps. The Notifications Centre has also been given an overhaul, adding the ability to respond to notifications from within the pull-down blind, but more on that later. What's more, users will be able to add third-party widgets to the notification centre and respond with one-swipe in a similar way to native apps such as Calendar and Reminders. One of the most convenient changes in iOS 7 was the Control Center, accessed by swiping up from the bottom of any screen, which gave instant access to airplane mode, wi-fi and AirPlay, as well as handy tools like the torch and calculator. iOS 7 also brought us FaceTime audio calls and the translucent Notifications Centre, opened by swiping down from the very top of the screen. In iOS 8 the Notifications have been overhauled again, so you can reply to messages, accept invitations and even like posts you're tagged in on Facebook without leaving the app you're running. Spotlight was a huge part of the OS X Yosemite launch, and it has found a home in iOS 8 as well. The redesign means Spotlight pulls up not only results from your device, but also from the internet, for example Wikipedia results, movie timings and even apps and iTunes content for you to buy. This gives it a huge boost over iOS 7 when it comes to search and integration with data from your existing apps. Apple are also tapping in to the health monitoring trend with HealthKit, a new hub that plays host to fitness and health apps such as Nike+, as well as Health, Apple's own monitoring app. Health creates a composite profile of your health and can relay the information to top institutions, including NHS, to easily share health information with doctors. Families will rejoice - or moan - at the new Family Sharing feature, which allows up to six devices to share iTunes purchases, calendars and photos. Find My Friends can be configured so parents can keep track of their kids and although the family sharing unit are all registered on one credit card, parents can rest easy, as kids' devices automatically send permission requests to parents' devices if they attempt to purchase anything. 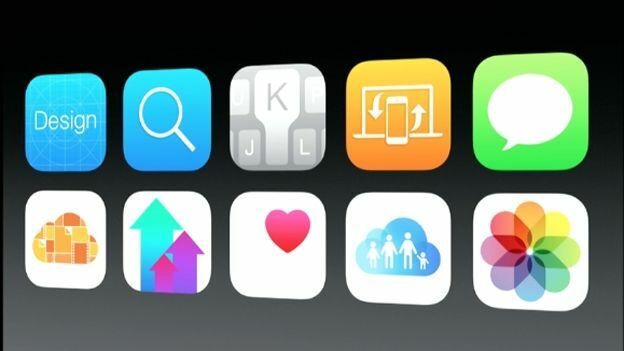 Check out our full list of iOS 8 features. Pleasingly, the iOS 7 made everything run that little bit faster and smoother, and that trend is continuing in iOS 8. Developers are able to take advantage of a huge 10 x improvement in draw-call rates, which should see a huge boost in the quality of games coming to iOS. Add to that the deal signed with Unity, Crytek, Epic and EA - who are bringing their Frostbite engine to iOS - and there should be a huge improvement over iOS 7. You'll also be able to view battery usage per app, as well as the data usage per app, so it's even easier to manage your phone activity. iOS 8 is compatible with iPhones 4S and newer, iPod Touch 4th generation onwards, and iPad 2 onwards. Both generations of iPad Mini will be able to run iOS 8.
iOS 8 fills in some of the blanks found in Apple's mobile operating system to date, and sets it up nicely for the next year of releases. The integration with OS X is much welcome, and something we've been screaming for since the beginning. The latest OS will play nicer with your other iDevices, be more intuitive and feel less oppressive than any other version of iOS to date.